Deemed to be the most important of the bridges in Putrajaya, the 435-m concrete bridge connects the Government Precinct to the Mixed Development Precinct, with the upper level of the bridge forming part of the Boulevard, the main street in the capital. The three-tier bridge is inspired by the Islamic architecture of the famous Khaju Bridge in Isfahan, Iran. Its magnificent attractions are the four minaret-type piers, complete with observation decks, overlooking the Putrajaya Lake. This unique bridge provides access to pedestrians, vehicles and a monorail, while its pier will be developed into a fine dining area with a place for boats to berth. The pink-domed Putra Mosque is constructed with rose-tinted granite and can accommodate 15,000 worshippers at any one time. The basement wall of the mosque resembles that of the King Hassan Mosque in Casablanca, Morocco. 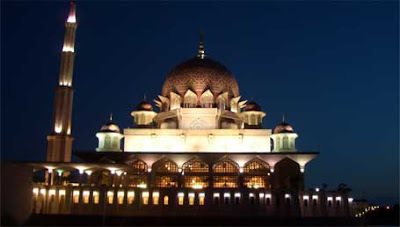 The Putra mosque consists of three main functional areas – the prayer hall, the Sahn, or courtyard, and various learning facilities and function rooms. The prayer hall is simple and elegant, supported by 12 columns. The highest point below the dome is 250 feet above ground level. The Sahn, landscaped with several decorative water features and bordered by colonnades, provides a huge yet welcoming and beautiful prayer space. Its impressive minaret is influenced by the design of the Sheikh Omar Mosque in Baghdad. At 116m, it is one of the tallest minarets in the region and has five tiers, representing the Five Pillars of Islam. Parkmay (Cityliner No. 868) goes through Sinar Kota-Komuter Serdang-Putrajaya-Cyberjaya every 20 minutes Sepang Omnibus (No. 536B) Route : Sepang-Banting-Dengkil-Cyberjaya-Putrajaya Frequency : Every 3 hours; Kenderaan Kelang-Banting (No.131) uses Kelang-Banting-Dengkil-Cyberjaya-Putrajaya every 2 hours Sum Omnibus (No. 186) goes through Kajang Terminal Bus-UNITEN-Putrajaya-Cyberjaya every 1 – 2 hours (Putrajaya Internal Nadi Putra bus services are available at 50 sen per ride). Catch the ERL train towards the KLIA airport from KL’s Sentral station. Express Rail Link (ERL) Route: KL Sentral/Bandar Tasik Putrajaya/Cyberjaya/Salak Tinggi/KLIA Frequency : every half hour (peak hours) every hour (off peak hours). To be perfectly honest, taking a public bus to and from Putrajaya, especially if you’re staying in faraway KL, is extremely impractical. Your best bet is to hire a car or a taxi for the day to better explore Putrajaya.